﻿ Creative Email Call-to-Action Ideas That Really Drive Action » Red Mango Marketing! You’ve figured out what to say in your email, designed it to catch the eye of your reader, and sent it out. You check your email marketing reports and… surprise! People are opening it! But they aren’t clicking. They aren’t taking action. You aren’t driving them to where you want them to be. It’s time to think about changing your email’s call-to-action. There are many factors of a successful call-to-action. But if you already have the essentials down, sometimes all it takes is a simple tweak in wording to get your readers to click. We’ve created this infographic to help you test out new ways to drive readers to your website, online survey, store, event and more. Try testing one of these new calls-to-actions in your next email campaign. Then, pay attention to your reports and take note of any changes in your click through rate. The more personable you can be in your emails, the more likely people are to click. So say goodbye to “click here” and hello to your shiny new click-through rate. Ready to start driving action with your new CTA knowledge? Log in to your Constant Contact account now. 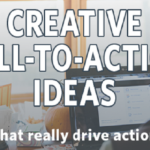 The post Creative Email Call-to-Action Ideas That Really Drive Action appeared first on Constant Contact Blogs. This entry was posted on Wednesday, June 1st, 2016 at 11:01 am	and is filed under click-through rate, content, Email Marketing, News & Updates. You can follow any responses to this entry through the RSS 2.0 feed. Both comments and pings are currently closed.